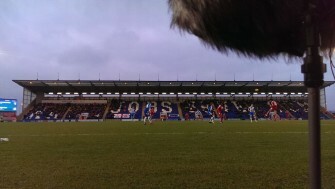 The game in play during the second half. The second of three recordings. Our media pass granted us access to the pitch, so for the second half of the game we were recording from just left of the halfway line, near the manager’s boxes. The reason for recording this particular match was that it falls on the same date as Colchester’s famous win over Leeds United in 1971 (see other recording). Unfortunately ColU weren’t on as good form today, as they lost 4-1 to Swindon Town, another club struggling to find form in League 1. This is the moment that their only goal, scored by Joe Edwards, went in during the second half.